^ The Saffir-Simpson Hurricane Scale. National Hurricane Center. 2007-08-17 [2014-12-27]. （原始内容存档于2014-11-21）. ^ Chris Landsea. Subject: D4) What does "maximum sustained wind" mean ? How does it relate to gusts in tropical cyclones?. FAQ: Hurricane, Typhoons, and Tropical Cyclones. Atlantic Oceanographic and Meteorological Laboratory Hurricane Research Division. [2014-12-27]. （原始内容存档于2014-10-09）. ^ Chris Landsea. Subject: D6) Why are the strongest winds in a hurricane typically on the right side of the storm?. FAQ: Hurricane, Typhoons, and Tropical Cyclones. Atlantic Oceanographic and Meteorological Laboratory Hurricane Research Division. [2016-01-30]. （原始内容存档于2014-10-11）. ^ 4.00 4.01 4.02 4.03 4.04 4.05 4.06 4.07 4.08 4.09 4.10 Eastern North Pacific Tracks File 1949-2007. National Hurricane Center. 2008-03-21 [2009-01-15]. （原始内容 (plaintext)存档于2009-01-15）. ^ Chris Landsea. Subject: E10) What are the average, most, and least tropical cyclones occurring in each basin?. FAQ: Hurricane, Typhoons, and Tropical Cyclones. Atlantic Oceanographic and Meteorological Laboratory Hurricane Research Division. 2002-06-11 [2014-12-27]. （原始内容存档于2014-10-11）. ^ 6.0 6.1 6.2 James Franklin. Tropical Cyclone Report Hurricane Kenna. National Hurricane Center. 2002-12-26 [2014-07-16]. （原始内容存档于2014-07-16）. ^ 7.0 7.1 F.J. Hoelzl. wea01151, NOAA's National Weather Service (NWS) Collection. NOAA Photo Library. National Oceanic and Atmospheric Administration. 1973-06-06 [2014-12-27]. （原始内容存档于2013-12-05）. ^ Max Mayfield. Preliminary Report Hurricane Guillermo. National Hurricane Center. 1997-10-02 [2014-12-27]. （原始内容存档于2014-11-12）. ^ Neal Dorst. Subject: H2) Who are the "Hurricane Hunters" and what are they looking for?. FAQ: Hurricane, Typhoons, and Tropical Cyclones. Atlantic Oceanographic and Meteorological Laboratory Hurricane Research Division. [2014-12-27]. （原始内容存档于2014-10-11）. ^ Jim Gross. Preliminary Report Hurricane Dalilia (GIF). National Hurricane Center: 3. 1989-08-30 [2014-12-27]. （原始内容存档于2012-10-22）. ^ 11.0 11.1 Andy Nash, Tim Craig, Sam Houston, Roy Matsuda, Jeff Powell, Ray Tanabe, & Jim Weyman. 2006 Tropical Cyclones Central North Pacific. Central Pacific Hurricane Center. [2014-12-27]. （原始内容存档于2014-12-18）. 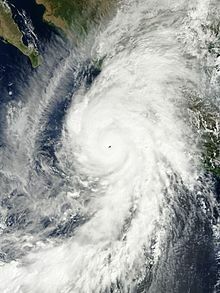 ^ 12.0 12.1 The 1994 Central Pacific Tropical Cyclone Season. Central Pacific Hurricane Center. [2014-12-27]. （原始内容存档于2014-12-20）. ^ Chris Landsea. Subject: G2) How does El Niño-Southern Oscillation affect tropical cyclone activity around the globe?. FAQ: Hurricane, Typhoons, and Tropical Cyclones. Atlantic Oceanographic and Meteorological Laboratory Hurricane Research Division. [2014-12-27]. （原始内容存档于2014-10-09）. ^ Cold and Warm Episodes by Season. Climate Prediction Center. [2014-12-27]. （原始内容存档于2014-11-29）. ^ National Hurricane Center; Hurricane Research Division; Central Pacific Hurricane Center. The Northeast and North Central Pacific hurricane database 1949–2013 (TXT). United States National Oceanic and Atmospheric Administration's National Weather Service. 2014-07-07 [2014-12-28]. （原始内容存档于2014-09-12）. ^ Re-analysis of the 1959 Manzanillo Mexico Hurricane (PDF). National Hurricane Center. 2016-02-04 [2016-02-04]. ^ Max Mayfield. Preliminary Report Hurricane Linda. National Hurricane Center. 1997-10-25 [2014-12-28]. （原始内容存档于2014-11-02）. ^ Chris Landsea. Subject: G8) Why do hurricanes hit the East coast of the U.S., but never the West coast?. FAQ: Hurricane, Typhoons, and Tropical Cyclones. Atlantic Oceanographic and Meteorological Laboratory Hurricane Research Division. [2014-12-28]. （原始内容存档于2014-10-09）.